Facing market uncertainty, manufacturers are relying on flexible, economical part production methods to accommodate for frequent changes while scaling up from pre-production to higher volumes. If production won't start at a high volume, but needs to build gradually to that, it makes sense to use the fourslide process. It can cost effectively go from pre-production to full production with easy ramp-up, and allows you to grow your market, hitting the part volumes you need. Whether launching a new product, improving a product, entering a new market, meeting customer demands or responding to market or technology changes, manufacturers need the ability to swiftly adapt their products to satisfy new requirements or conditions. To achieve this, manufacturers' part production capabilities require the same flexibility. The question is this: Can manufacturers' part production methods attain such flexibility without breaking the bank? With greater market uncertainty making part revisions more likely now and in the future, manufacturers need more flexible, economical part manufacturing methods to adjust along the way. Yet many find themselves choosing between labor-intensive manual methods for low-volume production or costly, inflexible progressive die stamping for high-volume production. As more manufacturers are discovering, a better solution is to adopt a part production process designed with tweaks and changes in mind that doesn't carry with it exorbitant tooling costs, and which can be scaled up cost effectively once higher volumes are required. "We needed flexible, low-cost tooling during product development," says Tim Tillery, Manager of Components Engineering at Ellisville, MS, USA-based Howard Industries, a producer of a wide range of products and services for global markets including power and distribution, medical, technology, lighting and transportation. "Until we were firm in our process and high-volume production demanded it, progressive die tooling costing tens of thousands of dollars would not be suitable for us." According to Tillery, after initial testing a number of design changes to a new switch terminal were specified to improve its durability and ability to bend. Tillery turned to an integrated stamping and forming operation called fourslide to make three tooling design changes including changing barrel diameter, specifying a softer material to allow easier bending and adding gussets to change the bending location from a narrow to a wider point. Since the company had already selected Fourslide Spring and Stamping, Inc., a Bristol, CT, USA-based firm that specializes in the fourslide part-making process, the decision was made to modify the existing tooling rather than retool at a much higher expense with another supplier. The fourslide process is capable of cutting typical tooling costs to as little as US$3000, halving tooling lead times and eliminating after-production adjustment to meet specifications with its unique integration of stamping and forming operations. The process begins with the raw material in flat strip form off a coil that is stamped or blanked in the progressive die section of the fourslide machine, which is a fully functional, but lighter version of the progressive die found in most power presses. Where high-speed power presses can cost hundreds of thousands of dollars, fourslide machinery typically costs just a fraction of that, enabling greatly reduced shop rates. Fourslide production at up to 15,000 pph can be achieved depending on part size and complexity. And since the process typically starts with material the width of the finished part, it usually generates less scrap than power press machinery, so material costs are often lower. "Using the fourslide process, all three tooling changes cost us just US$2500 total, whereas they would have cost at least US$10,000 had we made those changes to a progressive die," says Tillery. The fourslide process is capable of cutting typical tooling costs to as little as US$3000, halving tooling lead times and eliminating after-produciton adjustment to meet specifictions with its unique integration of stamping and forming operations. "If you want the flexibility to make inexpensive die modifications, you'd better choose a process like fourslide rather than run risk of replacing an expensive progressive die, which could cost tens of thousands of dollars. Fourslide helps with tooling cost, and allows us to make cost-effective design changes at any point in the production process." David Fielding, a Manufacturer's Sales rep with Younginer Engineered Products, who works with Tillery and handles multiple accounts including some for fourslide and progressive dies says, "If production won't start at a high volume, but needs to build gradually to that, it makes sense to use the fourslide process. It can cost effectively go from preproduction to full production with easy ramp-up, and allows you to grow your market, hitting the part volumes you need. Because the process can handle all volume ranges, if a part has the potential to go high volume, it can still benefit." When Anderson Power Products sought entry into a relatively new market, ease of tooling design change was a prime consideration. 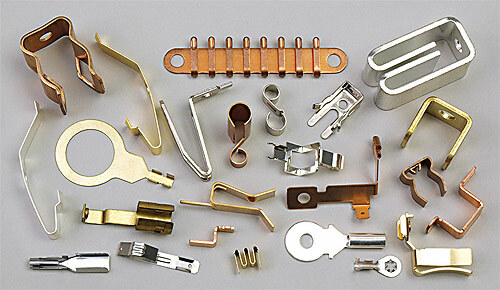 As an industry leader in the design and manufacture of high-power interconnects and accessories, with USA headquarters in Sterling, MA, USA, Anderson Power had used the fourslide manufacturing process for decades on a variety of flat springs for which close tolerances and some forms were critical. "There's always design iterations along the way, and it may be particularly true in a market that hasn't figured out which way it wants to go," says Craig Baker, Manager of Manufacturing Engineering at Anderson Power Products. "We didn't want to throw away half the tooling on a US$50,000 to US$100,000 progressive die if a part wasn't quite right and changes were needed. Progressive dies are complex. If one feature is off, it can throw off five other features." 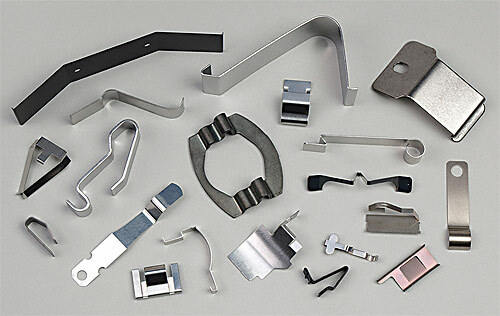 As the company developed a complex crimpable wire insert with considerable forming in a transition from a flat to U-shaped section, it turned to Fourslide Spring and Stamping. The fourslide part-making process has long been used for complex work such as that with involved forming, multiple bends or elements beyond 90° on parts less than 2" wide and less than 0.075" thick. It is also used for straight stamping to profitably ramp up new part production, cut part tooling and revision costs as well as improve quality and lead-time. "The fourslide process provides flexibility up front and an ability to change design on a dime," says Baker. "With it, if you have to make adjustments to part design, you may only lose a couple thousand dollars in tooling versus throwing out ten times that in tooling with progressive dies." While Baker appreciates such design flexibility early in production, he believes that the advantages do not end there. "Fourslide's design flexibility helps not just during early production and ramp up, but afterward too," says Baker. "It can easily keep up with a few million parts. We started out with the process decades ago in some cases and never left because we have no quality issues and it's cost effective." Depending on the part, Baker asserts that Anderson Power Products achieves about 30% cost savings and a savings of about one month in lead-time using a domestic fourslide process versus an overseas progressive die supplier. Click here to view an animated demonstration of the fourslide manufacturing process. For more information email info@fourslide.com. Del Williams is a technical writer based in Torrance, California.